Our Ninjitsu Ninja Warrior is a Fully Functional Forged Steel Full Tang Sword with Kozuka Knife inside the saya (scabbard). 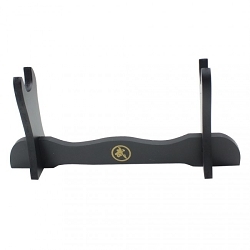 We will send you a free sword stand and a free cloth sword bag. This will come with a free decorative storage box. The actual box may vary from blue and red, and may or may not have hinges, this is a free gift to you. The Kozuka knife is 8 1/2 inches and is sharpened. Technically the Kozuka is just the handle, the blade is the Kokatana or Gokatana. This is a general utility knife, used much like a pocket knife. The saya of this katana sword is constructed of wood then painted black and lacquered. The sageo wrapping near the kurikata (knob) has a unique single layered style. This makes the sword unique. The tsuka (guard) is made of iron. The handle is wrapped in black cloth. The fully forged functional blade has a visible hamon and is very sharpened. We will send you a free stand with this sword. Please note that the stand may vary from the picture and will most likely be a wooden black stand. I ordered this sword for christmas and I think that this is my most beloved gift. This sword is simply amazing, a beautiful piece of artistic work. hi i got this yesterday and the pics are good but when i got this i was totally impressed with it by 1,000 times more then these pictures and the description. basically what im saying is wow, this is an awesome sword for this price. the blade on this is so sharp, i never owned a forged steel before, now im addicted. thanks again for offering this on your site.